I had the opportunity to interview Brody Derks of the Thule of Volkshof Kindred, about Heathenry and their upcoming event in June, the Northern Folk Gathering , at this years Paganicon. Tell me about your University of Minnesota experience? I was the president of the University of Minnesota Pagan Society, we networked with other groups around the Twin Cities. That was a wonderful experience to see all the Pagans in the surrounding area, and their diversity. I have always been a Heathen. I joined the Volkshof Kindred a few years ago. Now I am a representative. We are one of the strongest Heathen groups in the Twin Cities, and in Minnesota. We have built up our name, but there are other Kindred groups that we respect in Minnesota. How did you know you were a Heathen? My grandfather always told me, that I was a Heathen (laughs). He was Catholic, but they always told us Grimm’s fairy tales. I was raised bi-lingual, German – English. I learned German as easy as English. He would always tell me these folk tales in German. I was always interested in my heritage. 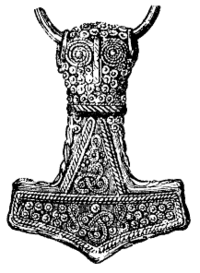 Heathenry is always heritage first, whatever else after. When I was a teenager, I developed a deeper interest. The draw I think, was the Gods and Goddesses of the North. I wanted more, I wanted to learn about this. I started to read books and publications and found this was what I needed. I was never much drawn to Christianity. I wanted to celebrate in ancestral in ways. I had a yearning for that tribalistic aspect. I looked at the Native Americans and they were big into their folk costumes and their traditions. What I discovered was Asatru and Heathenry, and what they were doing, basically the same thing but with their homelands and culture. I felt a natural calling, and that is what I have been doing ever since. Tell me about the Gathering this June? June 10-12, we have this event, the Northern Folk Gathering, it used to be called the Midwest Thing, but we have changed the name. Registration includes three days and two nights of cabin camping. We have open activities, and a Saturday night feast. It is at St Croix State Park at the boot camp. This is just outside the Twin Cities. We having folk coming in from Kansas, Michigan, and other parts of the country. It has a few different aspects. It is a gathering of tribes. The Chieftains do gather and and have meetings. We are part of an alliance of people, tribes, of the Midwest. We come together and make decisions that influence the road that Heathenry takes in the Midwest. There is also a lot of workshops, information about Anglo-Saxon culture. Kari Tauring will be presenting song and Stav. There will also be events for the children. We have plenty of children centered events, and we very much welcome children. If you are interested in the calling of the Northern path, of the Germanic Gods and Goddess, this is a wonderful opportunity to meet some of the people who have been practicing for fifteen plus years. We can steer people to where they can get more information, and actually see how we conduct our rituals. When people say Pagan, do you claim that name, too? We don’t claim that name Pagan at all. We call ourselves Heathens, as kind of separate culture or tree. We have nature based elements in our tradition, but we focus on the cultural elements of our traditions. We don’t focus much on magic. It is much more cultural. We gather to worship the Gods and Goddesses. There may be some magical elements, but that is not the focus of our gatherings. The focus is on celebrating our Germanic ancestry, and culture and to foster kinship among Kindred members. It is not really re-constructionist, it is very much a lifestyle. Volkshof Kindred is a Troth-affiliated Asatru (or Heathen) organization located in the Twin Cities, Minnesota. Polytheistic European tradition with an emphasis on the customs of the people; that sounds extraordinarily Pagan to me.